The 2019 Jaguar I-Pace is advertised as an SUV, but it’s really more like a hatchback. And a luxury sedan. Actually, the design that makes it hard to classify also creates one of the most versatile vehicles ever. The fact that it’s electric makes it slightly annoying to own, but quite satisfying to drive. About 230 miles of range electric means this Jag can’t exactly do everything. But what it does do, it seems to do well. Before undertaking a big transformation in the past decade, Jaguar was one of the more anachronistic car companies you could point to. This company built its whole brand on big displacement sedans, swaths of soft leather and hood ornaments. The chrome cats got moved to the trunks, but Jaguar’s still trading in signature exhaust notes and the average American’s assumption that all things English are fancy. Suffice it to say, that makes the I-Pace is the most abnormal Jaguar we’ve ever seen. And for the same reason, it’s also perhaps the most interesting. Jaguar can’t exactly abandon the look it’s worn for over 80 years in one fell swoop, but it had to do something dramatic to stay relevant in the luxury market while electric cars are hot and so are global temperature averages. And as a result of hustling to market, Jaguar’s only major rival in the practical luxury EV segment at this very moment is Tesla. That will change as Audi, Mercedes, BMW, Volkswagen and even Cadillac plan a big onslaught of EVs, starting soon. But Jag is one of the first at the table, so let’s see what its version of the future looks like. The I-Pace is a fully electric, long-roofed five-passenger luxury vehicle. Jaguar identifies it as its “first all-electric performance SUV.” But like I said, the car feels a little too dissimilar to anything else to fit into that category. It’s an interesting mix, in terms of size and shape. The body the I-Pace does occupy was designed by Ian Callum, whose work you might recognize from cars like the Aston Martin DB9 and Jaguar F-Type. This EV might not be as distractingly beautiful as those cars, but it does look good. Among every electric car on the road right now the I-Pace seems the most aesthetically connected to what car enthusiasts like to look at: swooping lines, a simple and expressive grille and fenders bulging all over the place. Jaguar says that the I-Pace is 184.3 inches long, making it just barely longer than a Toyota Corolla. It’s much heavier though, weighing 4,784 pounds. The cabin seats four comfortably, five if three in the back don’t mind getting familiar. The cargo area behind the back seat measures out to 25.3 cubic feet; it’s good for a couple big rollaboard bags and will easily swallow groceries but you’d have to pack light if you wanted to take four people camping in this car. There’s a tiny little cargo area under the hood where an engine would be if the I-Pace ran on gas. Jaguar says it’s 0.95 cubic feet; I can tell you it seems about the size of a lunchbox. Propelling this all-wheel drive EV are two permanent magnet synchronous motors, one for the front and one for the rear wheels, generating a total of 394 horsepower and 512 lb-ft of torque, according to the spec sheet. Those are powered by a 90 kWh lithium-ion battery, which is supposed to be able to charge from 0 to 80 percent capacity in just 40 minutes on a fast commercial charger. If you plug it into a 240-volt outlet at home, that should take about 10 hours. The I-Pace has an EPA estimated maximum range of 234 miles with a combination of highway and city driving, getting the equivalent of 76 mpg. If you don’t mind sacrificing that efficiency for speed, the car is supposed to be able to go from stopped to 60 mph in 4.5 seconds. By that measure it’s quicker than a Subaru WRX and a little slower than a Ford Mustang GT. When the road turns to gravel, or if you have a really steep driveway, the I-Pace can stilt itself up with air suspension that gives it 11 inches of ground clearance. That’s half an inch shy of a Ford Raptor. The I-Pace’s standout features are its excellent interior layout and ambience, that glorious glass roof, abundant and instantly available power, and the surprisingly satisfying weight of the steering. Pretty much in that order. Running in near silence, a byproduct of the absence of an engine, is something I grew to love very quickly in my short time with this car. But the I-Pace’s most outstanding characteristic, from a driving enthusiast’s perspective, is the fact that it feels like a really well-executed blend of what we like about sport luxury cars today and what we’re looking forward to in the future. 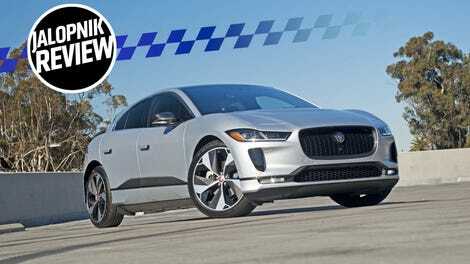 The I-Pace’s aggressive haunches and gaping maw grille give it a distinct family resemblance to the rest of the Jag line. That aura continues into the cabin, which feels artfully driver-focused. This is a very different approach to what you’ll find in other high-end EVs. The BMW i3 feels like a futuristic space pod. That car has about 200 surface textures inside, and a dang document shelf on the dashboard. Teslas are designed to feel like iPhones that happen to be cars—the spartan aesthetic is only punctuated by an enormous touchscreen. Conversely, the Jag feels like a cool car that happens to be electric. Until you turn it on and step on the, well, the not-gas pedal. There are enough driver assistance features that the I-Pace can feel like a quiet shuttle-pod when you want it to, but there’s enough personality that it can be rewarding to drive for the sake of driving, too. I think Jaguar did a good job building a vehicle that could appeal to people who like driving for its own sake, and those who are intrigued by an electrified and hyper-assisted driving experience. Like all electric vehicles, the fact that it takes a lot longer to charge an I-Pace than it would to fuel up a normal car forces some limitations on how you use the vehicle. And even in the technologically progressive metropolis of Los Angeles, in 2019, finding a place to plug in is a hell of a lot harder than finding a gas station. But having a provision for charging at home takes a big bite out of this problem, and if you can afford a brand-new Jaguar you probably live in a place where this is possible. What cannot be overcome, no matter where you park it, is the I-Pace’s annoyingly laggy interface. Like every other Jaguar and Land Rover, sometimes switching between menus, adjusting the car’s climate, or messing with the stereo just takes half a beat longer than you feel like it should considering how futuristic everything looks. I also had some frustrations with the parking cameras in the I-Pace. An immense amount of the vehicle’s dashboard real estate is dedicated to screens, and yet when I wanted to use the car’s 360 camera it only showed up in a tiny window. You can also look forwards, and backwards, and side to side via the individual cameras that create the 360 view, but I found toggling between these unintuitive. It was annoyingly hard to get the perspective I wanted. The “frunk” is too small to serve any practical purpose, the fixed panoramic roof can make it hard to escape the sun, and the I-Pace’s road composure really crumbles when its suspension is in the raised setting. The car’s “lifted” mode is really only intended for occasional operation; for scaling big bumps or bad terrain, but I found that my test car seemed to develop a strange bounciness even just cruising around the parking lot when its air suspension was raised. On the road, the I-Pace communicates the luxury sedan experience in the sense that it’s extremely smooth and serene, while turning the steering wheel feels like a purposeful activity. But someone coming out of a big E-Class or Jag’s own XJ might notice an absence of a sense of loitering power you get in a car with a V8. It’s a little ironic, because an electric vehicle has much more instantly available torque than a gasoline car by its very nature. Nevertheless, I love the sensation of having a thundercloud on a leash that comes with casually driving a big displacement engine. The I-Pace just kind of glides, then whisks you ahead like an adept bodyguard when you press on the go-pedal. As far as turning, that “purposefulness” I was referring to in the steering comes through as a feeling of weight when you change lanes or navigate through intersection. I did struggle a little bit with the I-Pace’s electronic steering system in parking lots though; at times I felt like I was spinning the wheel endlessly, like I was opening a door on a submarine. Of course, it probably would’ve been a little easier if both of my hands worked properly. I’ll come straight out and say I can’t tell you how well the I-Pace carves corners, because I’m still recovering from a hand injury and can’t quite hoon like I used to right now. But this car’s capabilities of forward thrust are impressive—if a little short of spectacular. The Comfort and Eco mode intentionally dull the I-Pace’s responsiveness to make the car feel much more natural at a socially acceptable pace. When you click it over to a Dynamic, besides activating a goofy artificial “propulsion noise” (which you can turn off, mercifully), you unlock that gut-punch rocket feelin we now associate with fast electric cars. But even the I-Pace’s hardest charge forward doesn’t feel anywhere near as intense as a Tesla Model S or X in Ludicrous Mode. It’s definitely not slow, and the sensation of speed doesn’t only exist when you’re going from stops to the speed limit as quickly as you can. The I-Pace can turn on the sauce from pretty much any normal driving speed. I’m not sure how that would translate to tackling canyons, but it definitely lets you leave lesser jokers in the dust on the highway on a whim. The base I-Pace starts at just under $70,000, and that version ships with all of the car’s best features including the 90 kWh battery, panoramic sunroof, AWD, LED headlights and a raft of parking sensors to help you get used to the car’s proportions. The $76,000 SE gets you nicer wheels, better seats, running lights and a power tailgate. The HSE adds even nicer wheels and a 825-watt Meridian sound system. Our HSE test car had a whole bunch of decorative options, including an absurd $4,390 carbon fiber accent kit, to ring up at $93,630. Compared to other $100,000-ish cars I’ve driven, the I-Pace HSE felt at least as nice, thanks to the big command center-style screen set up in the cabin. But I think the smart money is on the base model here. Skip the carbon and spend a couple grand to get your I-Pace wrapped in a cool color if you want to stand out. I relished driving this car for its responsiveness, comfort and style. I felt good about myself in it too, because it’s efficient and ostensibly good for the environment. And I really loved the fact that I could skirt off from anywhere in silence and drive hard without anyone raising an eyebrow because I was moving around so quietly. But the best accomplishment of the 2019 Jaguar I-Pace is baked into its design. Its shape and layout lets it feel like a luxury sedan, a crossover SUV, and almost, a sports car... if you crouch real low and look at it from the front quarter. Not only is the I-Pace versatile in terms of what it can do and how it can make you feel, it also manages to be futuristic without shrugging off a semi-traditional cockpit and all semblance is of steering feel. Put another way: the I-Pace could be something to people who’ve appreciated cars since they were kids, and those who didn’t care about anything with wheels until the Tesla model S came out, might agree on. A crossover that actually feels like a good combo of performance and practicality, that happens to be an electric vehicle.